Bear Auto Repair LLC takes pride in providing essential auto repair services to vehicles throughout Prineville, OR. We offer great work at reasonable rates, backed by a promise to never sell you any services you don’t need. Come to us for engine work, routine maintenance, auto AC, electrical systems service and much more. Foreign or domestic, no matter the make or model, we’re here to provide results. We’re a family-owned and locally-operated business, taking pride in delivering stellar service that keeps our customers coming back when they need automotive assistance. Our shop proudly stands by all work we do and we provide a 2-year warranty on all service and repairs we perform. We’re proud to have an A-plus rating with the Better Business Bureau (BBB) and work hard to live up to this recognition with each and every customer. Count on us to provide you with a free estimate on repairs, so you always know upfront how much service will cost. Our team is backed by more than 100 years of combined experience! When it comes to diesel and mechanical repairs, there’s not much we don’t do! Auto repairs are unavoidable, but just because you expect them doesn’t mean you should ignore them or look for a quick fix. To keep them few and far between, bring your vehicle to Bear Auto Repair LLC. 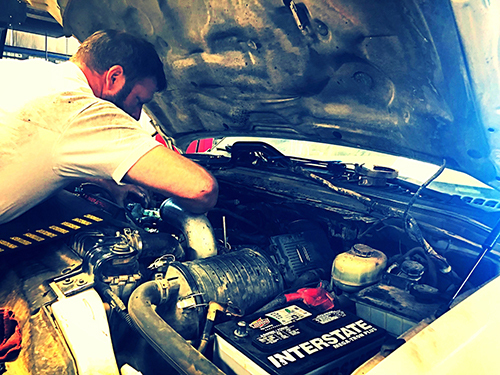 As your all-in-one mechanic in Prineville, OR, we’ll make sure any automotive issues you’re dealing with are resolved quickly and correctly, so they don’t linger to cause you more money and frustration. Whether it’s a faulty radiator that’s causing your engine to overheat or an electrical problem that needs a battery replacement to solve, you can count on us. We work fast and do things right the first time, so you spend a little time and money as possible, while still getting solutions that work. Since 1947, our auto shop in Prineville, OR has worked hard to earn the trust of our customers. Not only do we provide upfront pricing and estimates, we’re candid with our recommendations and never try to sell you services you don’t need. This penchant for honesty has made us the premier auto shop for area customers for decades, and we’re proud to stand by all of the work we do. We’ll even take the big jobs that other shops turn away, like engine and transmission repair and rebuilding. From mechanical failures, to routine services, to diesel repair, we promise Bear Auto Repair LLC is equipped to provide your vehicle with exactly what it needs to run smoothly for as long as you own it. Don’t let auto troubles bog you down! Get the solutions you need from experts with decades of experience behind them. Contact us today to schedule an auto repair appointment.